Rob Tamburri, CPA/PFS, is the Managing Partner- Georgia, based out of the Atlanta, GA office of the Certified Public Accounting Firm of Balog + Tamburri, LLC. He has been a CPA since 1993. 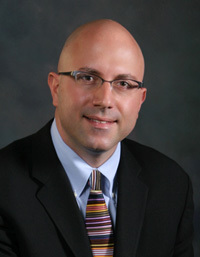 Mr. Tamburri manages the conduct of the Firms tax and financial consulting engagements. He specializes in Taxation, Accounting, and Virtual CFO consulting. He also has extensive experience working in the health care, real estate, manufacturing, automotive services, logistics, restaurants and personal service companies. Mr. Tamburri is a well-known speaker regarding tax and economic matters and has appeared on CNBC “Power Lunch” and Bloomberg Television. Prior to forming Balog + Tamburri CPA’s he successfully established The Tamburri Financial Group, LLC which specializes in investment management and financial planning. In 1989, Mr. Tamburri was recruited by Deloitte & Touche in New York City joining their financial services sector working with clients in insurance, real estate and brokerage. Additionally, Mr. Tamburri served as an analyst at Bear Stearns & Company in their Commodities and Futures Group and held finance and operations positions in the logistics and telecom industries. More recently, Mr. Tamburri from 1999 to 2009 was responsible for the finance and investment operations of a leading wealth management firm in Atlanta where he functioned as the CFO and led their investment committee. Mr. Tamburri holds a Bachelors of Science degree in accounting from the State University of New York at Albany and a MBA from the esteemed Thunderbird School of Global Management in International Finance. Mr. Tamburri has held FINRA licenses 4, 7,24,66 and is a Personal Financial Specialist (PFS). Mr. Tamburri is a member of the American Institute of Certified Public Accountants, and Georgia Society of CPA’s and is licensed as a Certified Public Accountant (CPA) in Georgia, Florida and New York, and is Personal Financial Specialist (PFS) as designated by the AICPA. Mr. Tamburri has been a Georgia resident since 1995 and resides in Dunwoody, GA.